The software gammaMap - which implements the analyses developed in Wilson, Hernandez, Andolfatto and Przeworski (2011) PLoS Genetics 7: e1002395 - is available for download. 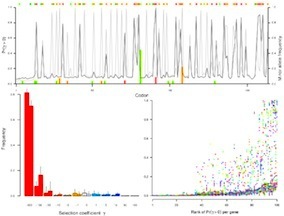 It is provided as part of a flexible program called GCAT (general computational analysis tool) which is designed to rapidly facilitate novel variations on the standard analyses. GCAT has its own google code page, http://code.google.com/p/gcat-project. GCAT resembles BEAST and BUGs in that a statistical model is specified (using XML) and parameters are then estimated using MCMC or maximum likelihood. Future extensions to GCAT are planned that implement new fast approximations to gammaMap and omegaMap, and parallel processing, allowing the analyses to be scaled more readily to whole genomes.